"Diess has been through the school of hard knocks at VW," says one analyst. As Volkswagen Group fought for its survival two years ago, Herbert Diess -- a fresh hire from BMW -- appeared headed for a rapid exit after a tense standoff with the company's powerful labor unions over cost-cutting measures. Today, he's poised to take VW's top job. Early in Diess's tenure as head of the VW car brand, labor leader Bernd Osterloh publicly questioned his credibility in contract talks, raising concerns that he might fall victim to the carmaker's complex internal politics, which has toppled many high-profile newcomers. "Diess is ready to weather conflict, which is important to make things happen in a company like Volkswagen," said Ferdinand Dudenhoeffer, director of the University of Duisburg-Essen's Center for Automotive Research. As VW's chief executive officer, "conflict will be part of the program." Volkswagen on Tuesday issued a cryptic statement saying Mueller has "showed his general willingness" to contribute to changes to the CEO job as part of a review of the group's management structure. The company declined to comment further. While the timing of the handover seems somewhat counter-intuitive -- VW is financially on the mend and has defended its status as the industry No. 1 -- Mueller had at times shown signs of fatigue. At recent public events, the CEO has appeared strained and prickly, a contrast to his previous persona as the easygoing boss of the Porsche car brand -- the job he held before being tapped for CEO in the chaotic days following the cheating revelations in September 2015. The planned shuffle is the result of longer-term considerations, according to people familiar with VW's thinking. As VW emerged from the diesel scandal, the company began reviewing its future structure, and how to streamline the still-byzantine conglomerate, said the people, who asked not to be identified because the deliberations aren't public. With two years on his contract left, Mueller wasn't viewed internally as the right man to implement sweeping change, including a possible spin-off of the trucking business, said the people. As a result, his own future became a point of debate, and Mueller agreed to make room, they said. At the Geneva auto show in March, the silver-haired Mueller gave only curt answers to reporters' questions before making a quick exit. Diess, by contrast, remained at ease, staying long after official proceedings ended to answer tough questions about the future of diesel. In public, he's appeared relaxed and in control, like the time when he smoothly batted away criticism on a German talk show last month that the car industry wasn't committing major funds to transition out of diesel. "Mueller has displayed a certain weariness about his post," said Juergen Pieper, a Frankfurt-based analyst at Bankhaus Metzler. 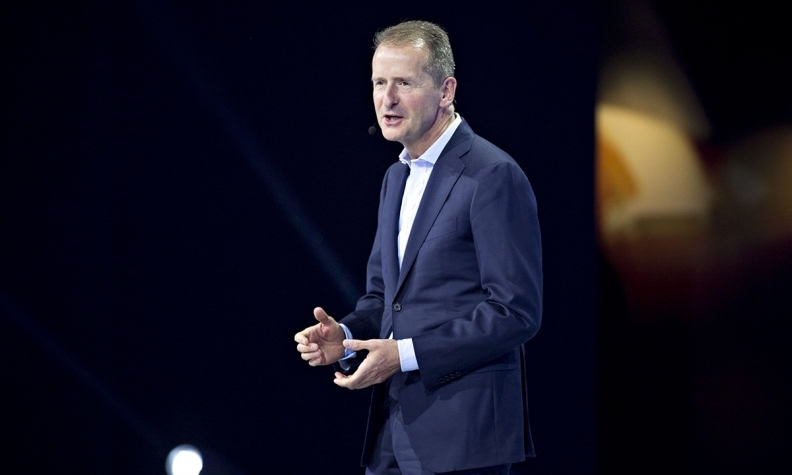 "Diess has been through the school of hard knocks at VW" and seems to have earned the respect of the company's power players. Unlike Mueller -- a four-decade VW veteran -- Diess has held senior positions elsewhere. After a brief stint in academic research, he joined supplier Robert Bosch in 1989. He rose to become a plant manager in Spain and then joined BMW in 1996. As head of purchasing at BMW, Diess was instrumental in the automaker's ability to weather the financial crisis by squeezing more than 4 billion euros out of supply costs. He then took charge of development, but was ultimately passed over for the CEO job, when the Munich-based company picked Harald Krueger in December 2014. That spurred his move to Volkswagen in July 2015, weeks before the crisis started. His hard-charging nature has come through at Volkswagen, where he's turned around the namesake brand by overhauling development and reining in costs. The long-struggling unit more than doubled profit margins to 4.1 percent last year from 1.8 percent a year earlier. He was also the first Volkswagen manager to talk about attacking Tesla in electric cars. "Diess has the advantage that he knows other companies," said Stefan Bratzel, director of the Center of Automotive Management at the University of Applied Sciences in Bergisch Gladbach, Germany. After more than two years of crisis management, "the course at VW has been set, and it's now about taking those steps."